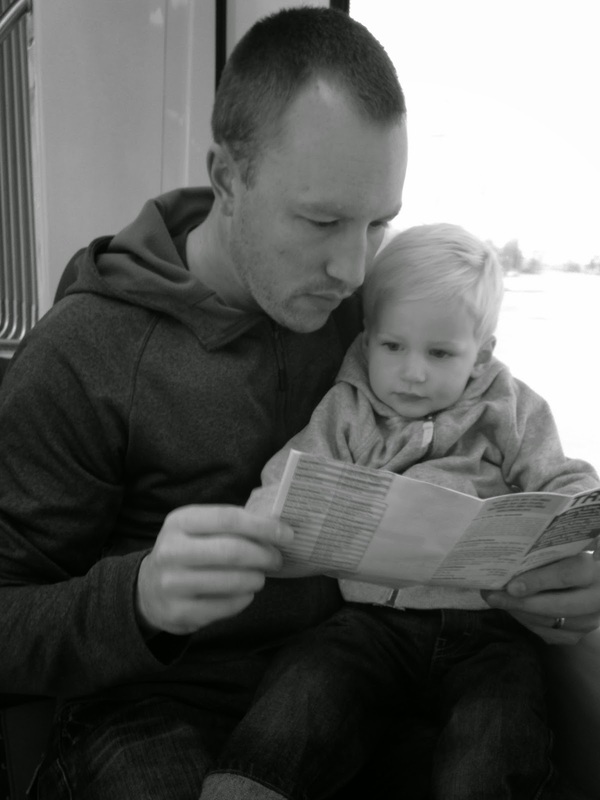 Not too long ago we took Liam on his 1st train ride! Or at least it was a train as far as he was concerned. 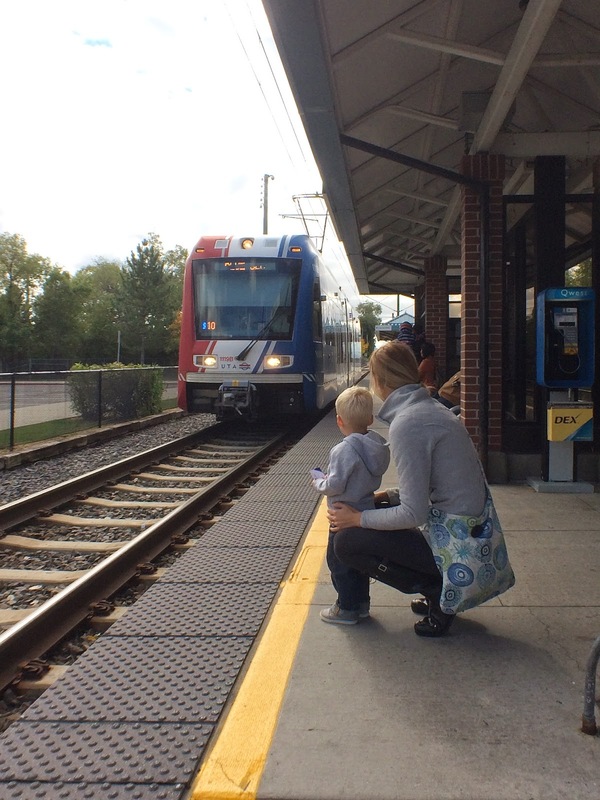 Really we rode the "light rail" or "commuter rail" that is Salt Lake City's public transportation. But who needs to get technical, a train it is! He sees the train going by everyday, but I don't think he ever realized that we could actually ride it! So one random Sunday afternoon, we rode the train downtown for lunch, just because! Just because adventures are some of my favorites! 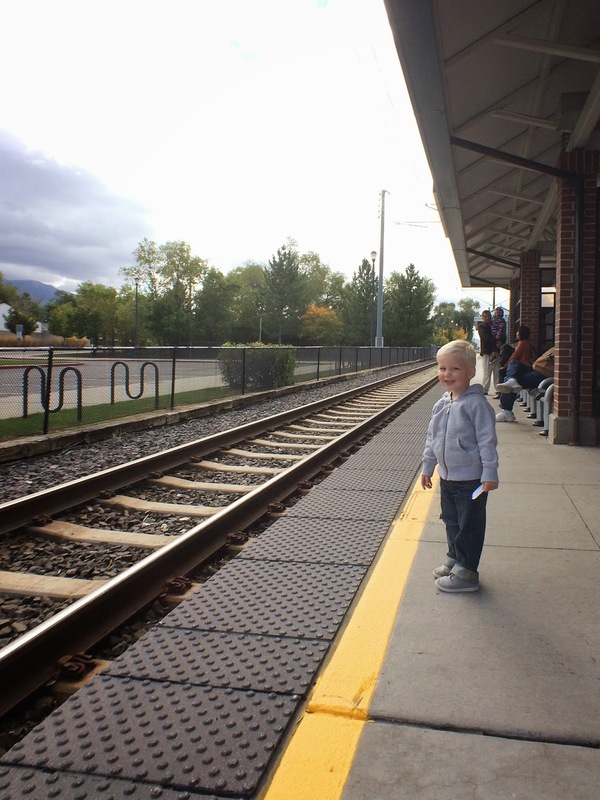 He proudly & patiently held his ticket as we waited for the train to arrive. He could not contain his excitement! Everyone around him was smiling as well, because his mood was contagious. Every once in awhile it's good to be excited about the little things, about some of the more mundane things in life. He practically ran on board and quickly chose a seat. He was anxious for "the guy" to come check his ticket and check out the map! There was an empty seat next to me, so we spent a good portion of the ride talking about how the baby would sit there when's it is all done growing. :-) He was in awe at how fast the train went and all of the exciting things he could watch blaze by as we made our way into the city! We picked a sandwich stop close to the train stop for a quick lunch. He thought the whole day was pretty incredible so far, especially once we told him we would be getting back on the train again! I spent so much of our ride sitting back and watching everything through his eyes. They were big & curious and absorbing everything happening in this new little world around him! Every time we see the train go by now, he talks about riding it to go get sandwiches. I can't wait to surprise him again sometime soon and go for another simple ride! Maybe we'll even mix it up and get dessert on the next visit! :-) There is "North Pole Express" train ride happening about an hour from our house this December, and I'm thinking about buying us tickets for that. It would take train rides to a whole new level, especially since this one would be an actual train! This toddler age is fun; we have many more adventures just waiting for us! This is something we keep talking about taking Wyatt to do. They actually have a "Polar Express' train near my parents and I'd love to do that! So glad he loved it!! So fun! I love when kids get excited about things we become used to! We used to live in an apartment right on the train station. My husband would take it everyday to work and noah would obviously see it but we never took it on him. He has been on one of those santa trains at Christmas time though and he loved it. Maybe we should take him on the commuter train one day now that he's into Thomas! !